Being behind the directors chair for two of Square Enix's upcoming biggest releases would be a stressful job, but Tetsuya Nomura doesn't seem that worried. Nomura revealed to Dualshockers that the toughest challenge of working on both of these games are managing his schedule. He does, however, see it as an advantage that both Kingdom Hearts 3 and Final Fantasy VII Remake are fundamentally different as if the games were similar they would start to look the same. He also sees it as an advantage that if something planned for one game doesn't quite fit, he might be able to work it into the other. 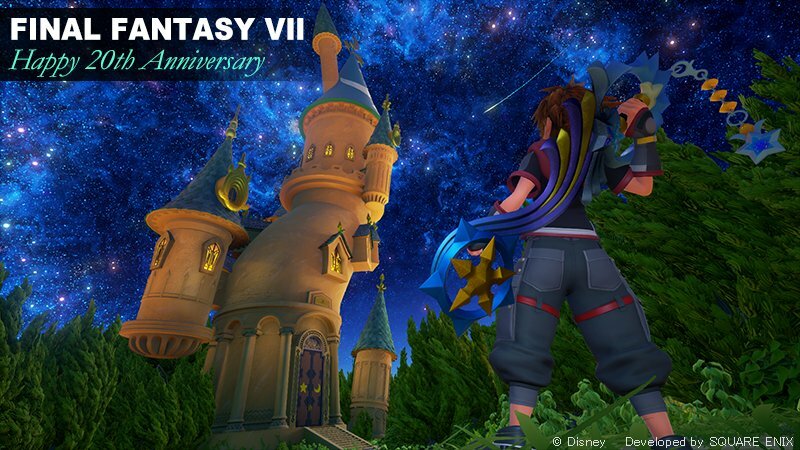 Nomura also discussed that despite the trip to the United States for D23 was a bit rushed, it aligned with a scheduled meeting for Final Fantasy VII Remake. This sort of planning allows him to use his time overseas wisely as director for both games. Dualshockers promised their full interview with Nomura will be available very soon! He also sees it as an advantage that if something planned for one game doesn't quite fit, he might be able to work it into the other. This is pretty typical in the gaming industry, especially for sequels. Despite the games being different, let's just hope the idea is "universal" to work in either game. Hyped for the full interview. I'm sure dualshockers knows how to ask the questions people want to hear. I mean, I thought it was obvious every Keyblade would have 2 transformations, but I guess it's nice to get a confirmation? They do look fun, and up until now, I like the guns from the Starlight-resembling Keyblade the most. While Kaori did confirm it in 2015, some were confused about if the Kingdom Key could have one. KH3 looking like Verus redux 2.0. Can't wait to see all the original Versus XIII references in Kingdom Hearts III. You can already see the Magitek armour inspiration in KH3 with the mechs. Here's hoping weapon/Keyblade switching on the fly also makes it in. I'm expecting FINAL FANTASY VII Remake to be more of FF Versus XIII's successor than KINGDOM HEARTS III in the sense that it'll have more Versus XIII-esque elements in the game than KHIII. VXIII had lots of KH inspiration; FFVIIR will most certainly grab onto whatever Tetsuya Nomura wanted to do with V13. See, I'm one that thinks that multiple Keyblades might actually bear an importance nowadays than in the past. In the past, you would always carry the Keychain that had the strongest Strength stat, or when you needed to farm for rare items, use the one with the item booster ability. With how the Keyblade system is shaping where each Keychain will have its unique transformation, possibly two, it's possible that each transformation will have its advantages over others. If you want to deplete a chunk amount of an enemy's HP, there's a transformation for that; if you want to attack lots of mid-weak enemies at the same time, there will be a transformation for that; and so on. With that versatility in mind, Keyblade switching on-the-fly would be idea. In summation: KH3 might feature an evolved form of FFXV's battle mechanics, tuned to KH's system. I'm so happy that we're getting to see more features to the game. However, I wish we could know more about the other worlds involved. But, that's probably just me. I, like many of you, also prefer to be surprised by the new features and worlds when I play the game (eventually, because I don't even own a PS4 T.T ). First of all, welcome! :D Make sure to read through the FAQ! Well, if you are going to buy a PS4 anyways and you have the money/can afford it, sure, go for it! Especially if the content is something you like. probably not they just didn't show it in this trailer for whatever reason. Most likely not, but the thought has crossed my mind a tad due to them being apparent in past trailers but not these last two, which is the current build (close to final) build of the game. They can't focus on everything in every trailer. Attraction Flow is a really big feature for them. They wouldn't cut it out, and if it was cut they would announce it before any confusion happened. This. It's like all the stuff that'd make sense to be in KH from vXIII are there and everything else that wouldn't fit (Stealth, character switching, etc.) are going into the FF7 remake. I love Nomura's work man. We're totally gonna see Stella wedged into this game at some point. Maybe the 2nd playable character is the one getting the rides?